Get a classy look for your reusable name badge needs. These three part Blank Mighty Badges™ come with a blank metal back plate and a clear lens. All inserts must be ordered separately. Customize each badge by printing your logo, names, titles or any personalization you might need on the inserts. Minimum order is only 10 Mighty Badges™, order as many as you would like. All inserts must be ordered separately. Save time and money with reusable name badges. Choose from one of ten sizes and a variety of shapes, including rectangles, ovals and squares. Print almost any text on the inserts and stack the three Mighty Badge™ pieces together for a professional name badge. Prices start at $5.45 each. Need A Logo? UV color logos add a bit of professionalism and class to the Mighty Badge™. Add a logo today! Price Includes: Clear lens, metal back plate, and standard fastener (pin, swivel bulldog clip, double clutch). 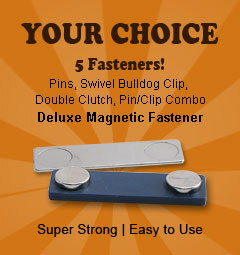 Upgraded fasteners, including deluxe magnetic fasteners, are available at an additional cost.